This is my second post for today, please scroll down to see the Pixie Cottage's Love Themed Challenge. 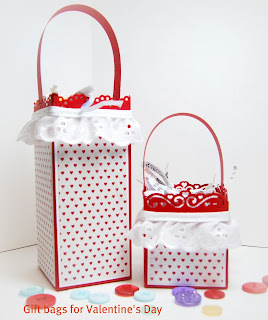 I'm back with this weeks All That Scraps Wednesday Challenge, this weeks theme is ideas for Valentine's Day . Now that the kids consider themselves "too old "to take treats to school, I had think about this project a little bit. At the end of the day, I decided to make Valentine treat boxes. Originally I had made three treat boxes of various sizes but wasn't able to capture all three treat boxes and card into the photo. I think that treat boxes are perfect ideas for gift giving. You can dress them up beautifully for a more sophisticated crowd or make them simple for kids. The possibilities are endless here! I feel my "mojo" trying to return and I plan to make some fancy Valentine treat boxes for a few of my friends. Once again I resorted to my scrap bin for design paper and used what I could find to decorate my treat boxes. Both boxes are embellished rather simply, I just add some eyelet lace trim. Of course I had to make a card and decided to feature C.C. Designs Honey Teacher Rubber Stamp. I covered Honey's Teachers apple with my sentiment titled "For You". 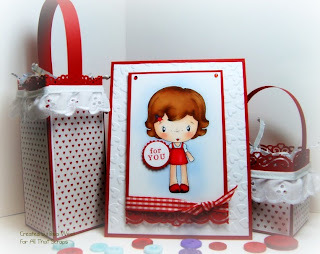 The base layer of my card was embossed with Sizzix's textured hearts embossing folder. I also used my EK Success hearts border punch to embellish Honey Teacher's mat and added ribbon and Kaiser half back gems for contrast. Have a beautiful day and I thank all of you so much for your kind and beautiful words of inspiration. Your acts of kindness truly touched my heart in ways that you could never imagine. Today's Pixie Cottage Challenge theme is ♥♥♥...Love...♥♥♥ ! As with all of our challenges, you can make a card based on our weekly theme or you can make a card based on the present sketch. This weeks challenge really helped to cheer my spirits. 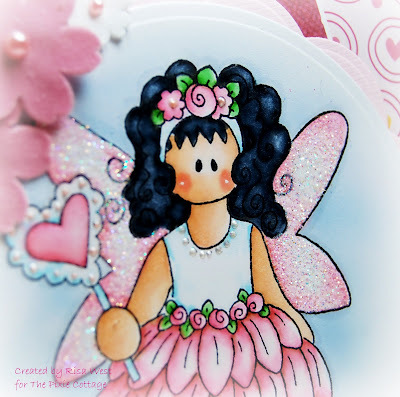 My image, Fairy Molly, designed by Ellen Gutierrez is among my favorite Pixie Cottage images. My image is colored in with Copic Markers and her wings were embellished with extra fine glitter. Other embellishments are felt flowers, Liquid Pearls an Kaiser half back pearls. I haven't brought any new Valentine design papers yet and had to resort to looking around in my scrap bin. I found a couple pieces that were large enough to make a card and that made me happy. Usually my scrap pieces are small and I can't stand it when I find a great piece of DP that is too small to do anything with! 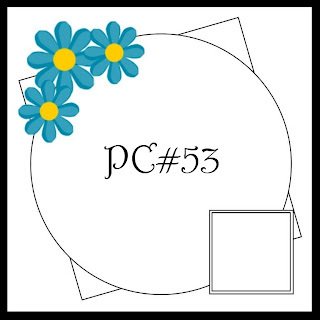 Should you decide to participate in this weeks Pixie Cottage Challenge, remember the theme is ♥♥♥ and we are looking forward to viewing your creations! Have lots of fun with our LOVE theme and if you feel the need for more inspiration, feel free to use this weeks sketch as well. 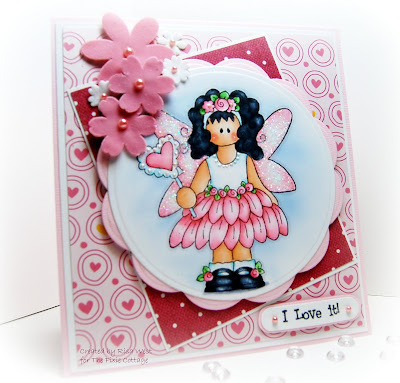 For more LOVE inspired cards, please click here to see the Pixie Cottage DT Creations, the girls really had fun with this challenge and I hope that you do too! Click here for the rules etc. card details...... 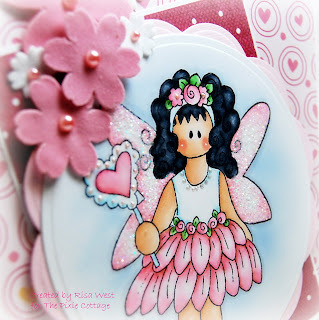 stamp...The Pixie Cottage's Fairy Molly,sentiment MFT....c/s Bazzill...DP from my scrap bin....inks Copic Markers and Memento Tuxdeo Black....tools SU's window punch, Spellbinders lg. circle and lg. scalloped circle dies.....embellishments...felt flowers, Kaiser half back pearls, extra fine glitter,Liquid Pearls and Liquid Glass on Fairy Molly's heart. Hello Everyone and Happy New Year Wishes To All! I've been meaning to post a note regarding my absence but no matter how many times I tried, I wasn't able to do anything that made sense. My cousin passed away suddenly right before Christmas and I haven't been myself for a while. We were very close throughout childhood and as adults, my cousin was like the sister that I never had, almost like my mom in some cases and most of all, my best friend. My entire family is still reeling from our sudden lost and the past few days (or weeks) have been very painful. I never knew that losing someone so close to me could be this painful, I've cried buckets of tears wondering why her? I know that God has his reason for everything and I'm really trying to come terms and get a grip on life itself. When I woke up today, I decided that today was the day to take life by the horns and deal with my pain by dealing with life itself. My husband and the kids have been understanding to some degree and I can tell by their faces that they are happy to see me coming back around. I hope that you all can forgive me but I wasn't in any shape to do too much of anything, I tried but when old memories got in the way, I just fell apart and retreated to my bed. I finally finished my card for Wednesday's challenge and it took me forever to finish it but I hung in there and managed a card that I can live with. Well...enough gabbing for me, I'm going to take a hot shower and get ready for bed, today has been a long one. *My Christmas post was created a week before Christmas and pre-scheduled, I should have said something before hand, but I didn't have the strength...the shock was too much to handle. I'm wishing the warmest of Christmas wishes to you and your family. May God shower his choicest blessings on you and your family this Christmas! Merry Christmas and may the New Year begin on a joyful note. 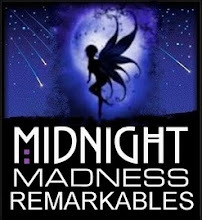 * I typed up both ATS and The Pixie Cottages challenges last night before I started baking. I thought that I had scheduled both post but apparently I didn't. At any rate, I'm glad that I followed "my mine" and checked everything out. 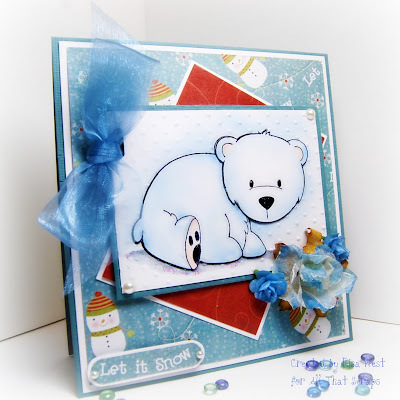 This weeks All That Scraps Wednesday Challenge is to make a card that is inspired by a song. The song that came to my mind was "Let It Snow, Let It Snow, Let It Snow", I think the song is by Dean Martin but I'm not 100% certain. I gave Sugarplums Polar Bear some dimension with layering and for a little color, I lightly airbrushed B00 around Polar Bears outer edges. 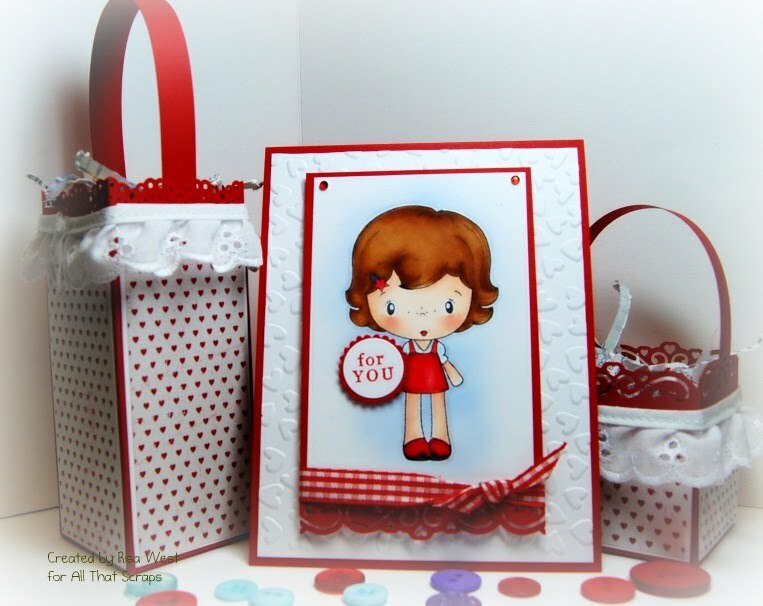 I embossed the white background with Cuttlebug's Swiss Dots embossing folder. 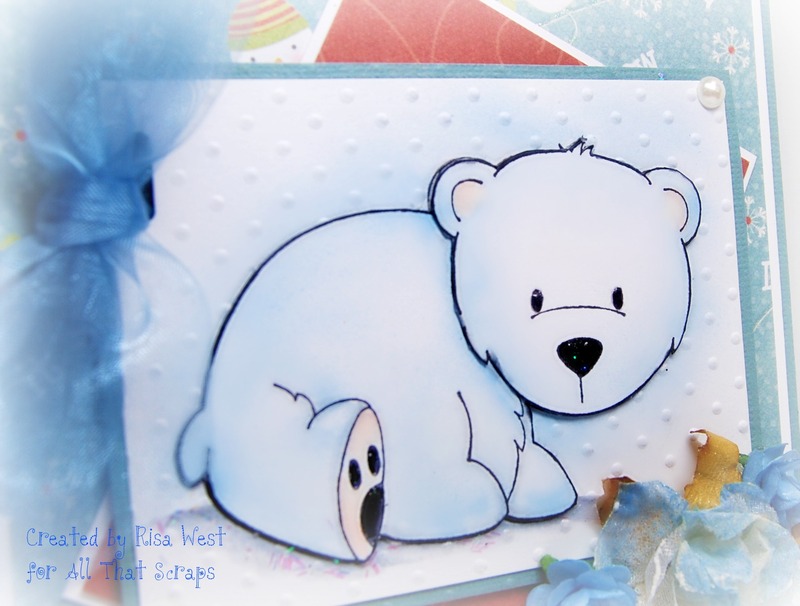 At one point, I was going to emboss Polar Bear but decided not to at the last minute. (I was afraid that I was going to mess up and didn't have the time to start over again). My design paper, by Imaginisce, is titled "Let it Snow" and I simply punched out the words and applied it to my card. For more Inspired By A Song cards, please be sure to stop by the All That Scraps Blog for inspiration. The girls had a lot of fun with this challenge and I'm sure that you will too! We hope that you are inspired by a song and that you participate in this week challenge. Please link your challenge cards to the All That Scraps blog before 9:00 p.m. est next Tuesday. stamp C.C. Designs Sugarplums Polar Bear rubber stamp, sentiment taken from my design paper.....Imaginisce, c/s Bazzill and PTI, design paper Imaginisce....inks Copic Markers and Memento Tuxedo Black.....tools SU's window punch, Cuttlebug's Swiss Dots embossing folder and air brush compressor ....embellishments ribbon, Prima Flowers, Black Stickles and Kaiser half back pearls. Take care, have a beautiful day and thanks so much for stopping by!